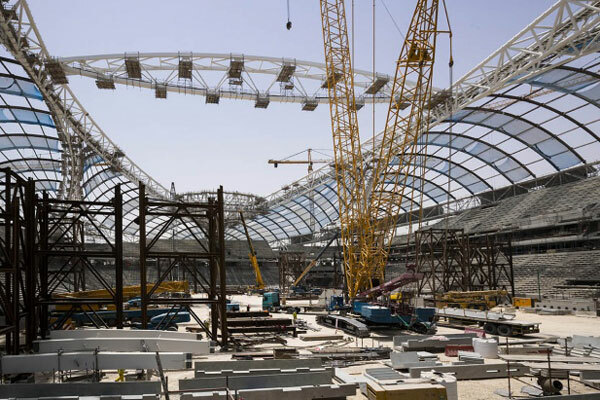 Work on the Al Wakrah Stadium, a likely venue for 2022 Fifa World Cup tournament, is progressing as per schedule with installation of the final piece of the steel roof structure fully completed. Weighing 378 tonnes and measuring 92 m, the steel structure – known as an ‘oculus beam’ – sits 50 m above pitch level. It will connect and support the entire roof, while providing maintenance access to some of the retractable parts of the structure, said a statement from the event organisers Supreme Committee for Delivery & Legacy. The beam was welded and assembled onsite over 20 days. Originally six pieces, the structure was built on temporary frames before being lifted into place. The entire welding, assembly and installation process took 40 days. Once completed, the stadium’s retractable roof will be able to close with a PVC Titanium O2 double side coated membrane in approximately 30 minutes using a number of steel wires, they stated. The roof will provide shade to the entire pitch and contribute to the efficiency of the stadium’s innovative cooling system. Situated in one of Qatar’s most historic areas, the design of Al Wakrah Stadium takes its inspiration from the seafaring tradition of the region, with the roof shaped to replicate the sails of a traditional dhow boat, iconic to Al Wakrah’s shoreline for decades. The work is in fuill swing at the 40,000-seat venue will be hosting matches up to the quarter-finals stage in 2022, and is due to finish within the next 12 months. Thani Al Zarraa, the Supreme Committee for Delivery & Legacy’s Al Wakrah Stadium project manager, described the roof installation as one of the final major milestones in the project. “The stadium is beginning to reflect its memorable and unique design,” said Al Zarraa. “Installing the roof is a major step forward for our project and almost the final piece of the jigsaw,” he stated. "Installing the seats soon, in the iconic blue and white colours of Al Wakrah Sports Club, is also helping to bring the stadium to life," remarked Al Zarraa.